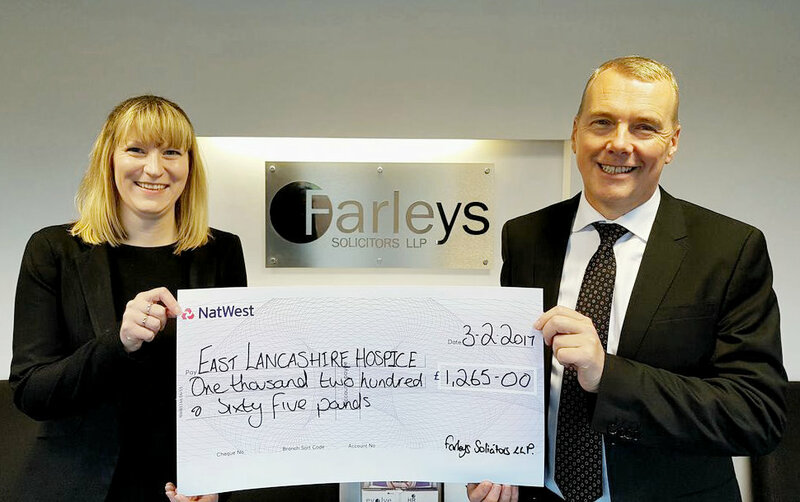 A Blackburn solicitor has given East Lancashire Hospice a helping hand by presenting them with a bumper cheque for £1,265. The money, which will help to provide care for local people who are coping with a life-limiting illness at a time when they need it, was the result of Will Week. Farleys Solciitors, who has taken part in the charitable scheme for 6 years, writing wills for clients in exchange for a donation to the hospice. Phil Taylor, Partner, said: “East Lancashire Hospice is an incredible place, doing amazing work for patients and their families and we are delighted to participate in their Will Week. Denise Gee, fundraiser at East Lancashire Hospice, collected the cheque. She said: “We would like to say thank you to Farleys Solicitors for their continued support, and express our sincere thanks to everyone who has donated towards the hospice.